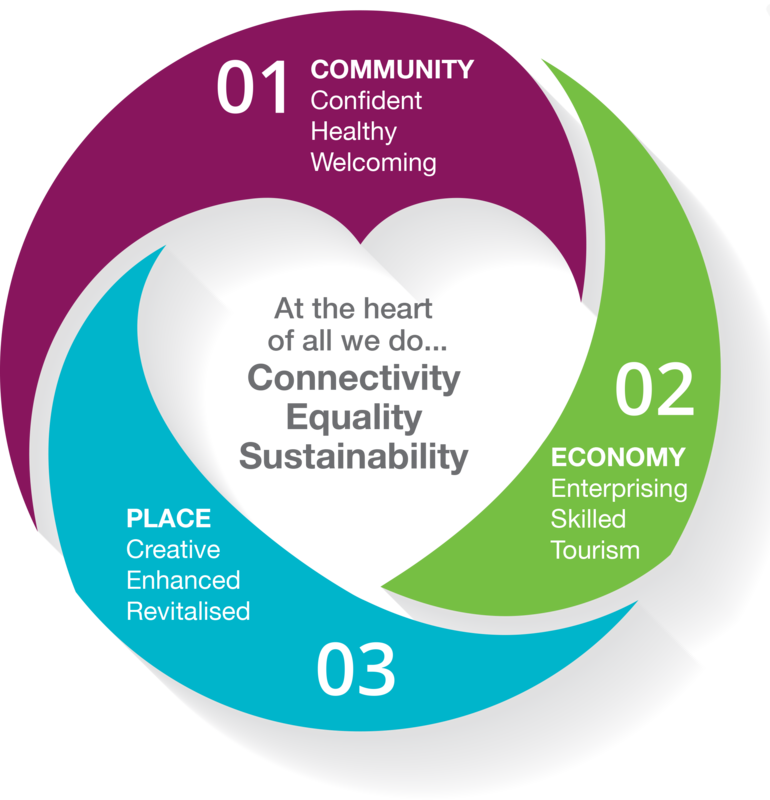 We have a happy, healthy and connected community, a vibrant and sustainable economy and appealing places for living, working and learning. The Community Planning Partnership for the Armagh City, Banbridge and Craigavon Borough will take a collaborative approach to achieving the outcomes outlined in ‘Connected’. All community planning partners share an equal responsibility for the implementation and delivery of the plan. The diagram below shows the partnership’s structure for the borough. It is flexible and will evolve to meet the needs of the plan. The partnership is made up of a Community Planning Strategic Partnership, Thematic Action Planning Teams, an Engagement and Communications Working Group and a Community and Voluntary Sector Panel. 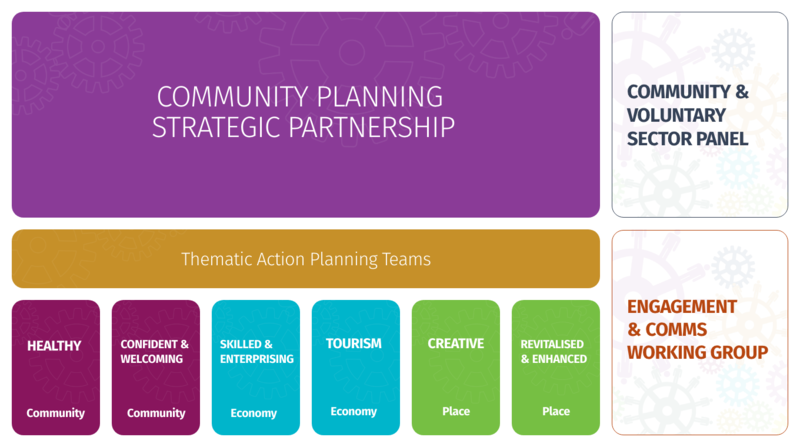 The Community Planning Strategic Partnership is a group made up of a wide range of partners including representatives from the thirteen statutory organisations, political representatives and community organisations. The Community Planning Strategic Partnership (CPSP) is the main decision body for community planning in the borough, it is focused on building relationships and seeking active participation of partners in all decisions and activities. We are currently in the process of establishing six Thematic Action Planning (TAP) Teams to develop, implement, deliver and report on the actions identified through the action planning process. Five of these teams have started to meet. The TAP’s are to be action and outcome focussed to help ensure the relevant outcomes are achieved. These teams will be responsible for developing action plans, identifying local partners, reaching out into the community and ensuring the cross cutting themes are central to activities. They will be led by a Statutory Partner and will also be responsible for using evidence to identify particular areas of need and tailoring programmes to adequately meet those specific needs. The Voluntary, Community and Social Enterprise Sector (VCSE) play a crucial role in improving the quality of life for local communities across the Borough. Our Community and Voluntary Sector Panel met for the first time in May 2018, the panel has a broad membership with 38 organisations involved. The Panel provides an opportunity to build relationships and connect more voices to local public services and decision making bodies through community planning. The Panel is chaired by John McGuiness from ABC Community Network and the Vice-Chair position is held by Geraldine Lawless from P2000. Panel Members sit on each body of the governance structure with two panel members sitting on the Community Planning Strategic Partnership.